Editor’s note: Today I am sharing an article written by Yoav Litvin a Postdoctoral Research Associate at The Rockefeller University. He presents to us the “artist’s dilemma” and gives us a topic that ought to be discussed. Whilst he is addressing the dilemma artists face when they fail to act from integrity, it is important to note that selling out might mean different things to different people. Apparently Shepard Fairey has various ideas about integrity and selling out. In my honest opinion, if you can live with yourself and act from your own integrity then it seems likely that you are not a sell out. But why do artists even find themselves in this predicament – simply misplaced value or should I say lack of understanding of the value visual arts plays in society. Without moving too far off topic, I just want to comment about how frankly tiring is the unrealistic fantasy ideal of the starving artist – you can’t do any good in the world or get your message out when you are operating out of desperation and poverty – it serves NO ONE. A huge problem that faces the field of visual arts especially (outside of photography and video) is the idea that it is less important then engineering or other occupations. That is simply not true. If you want to know why I say that or want me to back it up just comment below and I’ll discuss further. Thanks for taking the time to visit the blog and don’t forget to share this with you friends and join in the discussion in the comments below. Intellectuals, academics and artists play a unique role in society: they preserve and defend both freedom of expression and the morality of choices. Artists can use their work as a means to communicate messages of dissent and hope in the face of injustice, repression and despair. Meanwhile, those in power who seek to control public opinion typically consider untethered freedom of thought and expression a threat. But in any capitalist system, it’s difficult to survive as a full-time artist. Artists need to be industrious in order to make a living from art, and may choose to work with government organizations or corporations to supplement their income. Herein lies what I’ve dubbed the “artist’s dilemma”: how does one cooperate with a large entity while ensuring moral ground? In other words, what constitutes “selling out,” arguably the worst insult that can be lobbed at an artist? It’s an issue that has come to the forefront, especially for street artists, who seem to be increasingly collaborating with businesses and corporations. Companies will often seek to cultivate artists as a way to enhance their brand, and street art can have the effect of making a product look more authentic, edgy and gritty. Recently, a blogger and a group of artists have partnered with Amazon to produce and sell a series of limited edition prints, and the USA Network commissioned artists to promote a new TV series by producing ads that look like authentic works of street art. Meanwhile, in some instances, the boundaries between political activism and commodification have blurred. Earlier this year, the street artist Gilf! made headlines for wrapping yellow caution tape with the words “Gentrification in Progress” around shuttered buildings throughout New York City. But the caution tape can now be had for the price of US$60. What is apparent is that with the growth of corporate control over public spaces – along with the relentless attempt of corporate entities to commodify anything and everything – the debate about street art and artists “selling out” is not only relevant, it’s necessary. In order to methodically tackle this issue, it’s useful to look at it through the lens of The Prisoner’s Dilemma, a game analyzed by use of principles of game theory. The Prisoner’s Dilemma, developed by mathematicians Merrill Flood and Melvin Dreshner, is an analysis of a hypothetical situation. The police apprehend two accomplices for committing a minor crime, but they’re suspected of a greater offense. The evidence for the greater offense, however, is circumstantial. The police need their confession to convict. For this purpose, the accomplices are separated and individually presented with the following options: squeal on your partner and go free (and be absolved of the lesser crime) or remain silent and risk your partner squealing on you, in which case you’ll get the maximum prison term for the major offense. But there are two more possible scenarios: if both prisoners squeal, they each get an intermediate sentence. Lastly, if both prisoners stay silent, they’ll be tried for the lesser offense, and could still end up in jail. Studies show that although game theory predicts that the rational choice for each prisoner (dictated by self-preservation) is to squeal on his or her partner, most humans will attempt to at least remain faithful to their partner once before giving them up, which demonstrates the tendency of humans to value social bonds. So what does this have to do with artists, their art and the idea of selling out? Let’s apply a similar “two-by-two” approach to the artist’s dilemma. Many artists use the streets as an ad space for their art; they view the public as potential clients and pride themselves on corporate partnerships, which can be quite lucrative. In this case, as long as artists are clear about their overarching goal – promoting sales in a capitalist market – they can’t “sell out.” In a sense, these artists are smaller versions of commercial enterprises that use public space to advertise their products (often without having to pay for the space). At the same time, artists who have any kind of moral presumptions guiding their work need to assume certain responsibilities. For one, if they are receiving funding from a corporation or government organization, they need to research each entity’s respective agendas. It could simply mean doing some background research on the internet, but it could also entail communicating with the organization itself and asking what it stands for, what it opposes and what its mission and goals are. If, after adequate research, the entity’s agenda coincides with the artist’s, the work is morally kosher. However, education also entails risk: if the artist discovers the entity is morally corrupt, at least by his or her definition, it’s the obligation of the artist to forfeit the financial opportunity in order to hold moral ground. If the artist has found that the organization is morally corrupt and still chooses to work with it – well, the artist is, by definition, selling out. There’s another outcome: the artist can choose to stay ignorant and work with any organization solely for the money. If the artist is lucky, the organization turns out to be morally sound. However, if the organization turns out to be morally corrupt, the artist can’t simply plead ignorance when being called a sellout. Pleading ignorance, of course, doesn’t excuse the artist from the consequences of collaborating with a morally corrupt organization. At the very least, he or she must assume responsibility after the fact. Organizations and corporations involved in the arts also have a moral responsibility. They need to be transparent about their policies and political agendas so that artists can make informed decisions, and don’t have to do all the work themselves. if it was not supplied to the corporations by me, then it would be supplied by other hungry designers. According to this statement, it’s apparent that even though Fairey is aware of the questionable moral agendas of some of the corporations that commission him, he still takes their money. So is he a sellout? Not according to Fairey’s definition of selling out. …doing things on my own terms outside of the system when necessary, while also seizing opportunities to infiltrate the system and use its machinery to spread my art and ideas, hoping to change the system for the better in the process. Here, Fairey assumes a Robin Hood-like approach: taking from exploitative corporations and using his commissioned art to chip away at their influence by, for example, raising awareness about war. 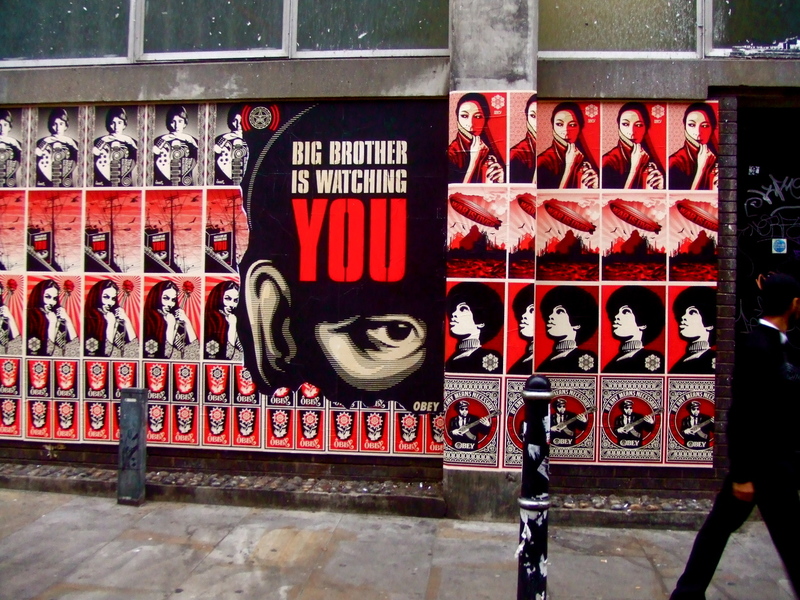 Shepard Fairey leaves his mark in London’s East End. Fairey’s dealings with corporations fall within the definitions of selling out, as outlined by the artist’s dilemma. And one must wonder how much influence corporate entities have over Fairey’s art and messaging – surely the commissioned work, but also his street works. Nevertheless, it is undeniable that these dealings have enabled him to devote significant time and resources to putting up works on the streets that endorse progressive, noncommercial (even anti-commercial) causes. So in order to evaluate whether or not Fairey is selling out, it seems that one must weigh the influence of corporate interests on his work versus the benefits of Fairey’s works on the streets. The example of Fairey demonstrates the limitations of applying a simple two-by-two theory as a sweeping criterion. Nevertheless, the artist’s dilemma can act as a frame for this important discussion: it unequivocally demonstrates that artists need to be transparent and accountable. They have a responsibility to forge moral alliances with employers that could have potentially conflicting agendas.